The Eurovision Party season continued unabated with a party hosted by the Greek and Cypriot delegations and the huge Eurodom. More than half of this year’s contestants performed on the stage to a packed house. The central and extremely handy Eurodom was again the venue for several parties last night. we arrived as the Ukrainian party was winding down, in readiness for the party hosted by the Greek and Cypriot delegations. By now, every delegation is in town, so the Eurodom was getting really busy. Our hosts thanksed us all for coming, and reminded us that the bar was free all night. Then it was on with the show. Over the course of the next few hours, we were treated to songs by more than half of the competing nations – Czech Republic, Belarus, Belgium, Estonia, Moldova, Latvia, Ukraine, Malta, Bosnia-Herzegovina, the Netherlands, Armenia, Slovenia, Montenegro, Serbia, Slovakia, Iceland, Croatia, Finland, Romania and Ireland. They all performed their own songs, although of note Inga and Anush performed another number, and Marko Kon gave a second rendition of his song in Greek – to much excitement. Between Finland and Romania, our hosts took their turn. 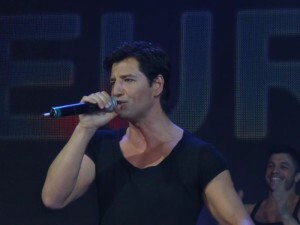 First on was Sakis, performing an extended set. He had a few problems, with him preparing for one song and the backing track for another being played. While he is a crowd pleaser, you could tell that many people were a little bemused by this lack of professionalism, especially from a host delegation. After maybe 20 minutes he vacated the stage for Christina Metaxa and Co. She performed a couple of songs, and gave yet another very nervy performance of "Firefly". Her brother Nicolas has written this song, so then he sang it with her as a duet. I’ve always liked the song, however she is perhaps not the most capable of vocalists. But this duet was amazing, and we all wondered why they didn’t enter this version instead. From a song that will struggle to qualify, they had a potential hit on their hands. A bit of a shame really. All in all, the number of delegates made this party. It was neither as lavish as Belarus’s, nor intimate as FYRoM’s, but it wasn’t without its charm. The diehard fans among us loved it, and for many the party then continued at the Eurocafe nearby. We now wait and see what the official opening party will bring this evening.